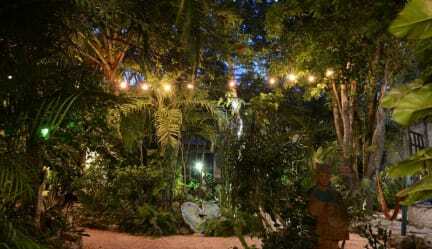 El Jardín de Frida is your home in Tulum, we’re an Eco-Cultural Poshtel, full of magic, culture and art built around a beautiful botanical garden. The project is inspired not only in Frida Kahlo’s amazing life, but also in Mexico’s great culture, art and traditions, offering all that in your stay. We have three Double Rooms, three Suites, one Single Room, one five beds Dorm and one seven beds Dorm. Freshly made and healthy continental breakfast included. Our Suites, named in honor of great Mexican culture icons, provide you with the comfort of having a separate bedroom, your own kitchen, a small living room and a spacious private terrace, all with A/C and fans. Our Double Rooms are thematic, representing aspects of the Mexican Culture and Folklore. Spacious, clean, fresh, all with A/C, fans, private bathroom and jungle view balcony. Our Single Room is a perfect option for a lone traveler who wishes to have more privacy. It has its own private bathroom and ceiling and floor fans. Our Dorms are clean, spacious, with single beds (not bunks) and full bathrooms ensuite. One with 5 beds, A/C, fans and one bathroom and one with 7 beds, ceiling fans and two bathrooms. We are located in Tulum’s residential area, on the main avenue, 5 minutes away from downtown and the bus station. We cater to guests looking for a quiet and comfortable place to relax, surrounded by a beautiful lush tropical garden. The first of its kind in Tulum town, we use solar panels to generate 80% of our electricity and we have a modern biodigester to treat our organic residues. Our garden is programed to help you heal and release any energy you no longer wish to carry with you. You will be surrounded by the beauty of nature... The singing of the birds in the morning will wake you up and the chirping of the crickets at night will accompany you in your dreams. The facilities are designed to provide a pleasant and fresh stay every day of the year; nevertheless, we have ceiling fans in all rooms and air conditioning where specified. In our Restaurant you’ll find delicious and healthy dishes made with regionally and locally sourced ingredients like free range organic eggs and dairy. We have vegetarian and vegan options too. In our beautiful botanical garden you will find different species of local trees and plants, like the sacred Mayan tree or the chicle (bubble gum) tree, amongst others. Here you can learn about our local flora and their uses. We also have a hammock site where you can lay down below bamboo trees, a great place to arrive and chill after a day of exploring the area. We are concerned not only in the quality of service but also in developing activities that benefit the planet. We offer you a good price, an excellent service and an unforgettable stay full of magic, nature and Mexican culture. Here you sleep, learn and heal. *Connection may be limited in some rooms depending on your device’s reception. We are located on Tulum's main avenue, 4 blocks south from the center of town, in a quieter and calmer area. You'll find us on the right side of the main avenue when going towards Chetumal (South) after the intersection with Kukulkan street, almost across the road from famous seafood place El Camello Jr.
El Camello Jr Ceviche House, were you can find fresh fish and ceviche, a very local spot for seafood run by fishermen. Chac Mool and Meztli language schools were you can learn Spanish and Maya. Great hostel with beautiful scenery on the grounds. Far enough away from the noise of the main street of Tulum but close enough to walk, or rent a bike from the hostel. A very relaxing place to rest between all of your activities. This hostel is really lovely. The huge garden is a delight to sit in and the hammocks and chairs are great. No bunk beds which is awesome. It is a little bit far down the main drag but the walk is not that bad. The restaurant and bar are a bit pricy but the vibes are good. Very secure. I would stay here again. The beds were super comfy. Great hostel, but the restaurant and bar is a bit expensive. Wonderful oasis of calm and charming decor. We loved this hostel. The staff is super helpful and the overall vibe was exactly what we were looking for. Relaxed jungle-like atmosphere with nice staff, tasty breakfast, wifi good but not always available in the last upper room. Fully recommendable accommodation! Only minus: neighbours played loud music until around 3am. Windows cannot be closed. Lovely Hostel! Stayed in the spacious and clean private room. Garden / common area nice to hang out, lovely staff, good breakfast, love their eco approach. The only downside is its location next to a busy road, which made it rather noisy and hard to sleep (even with ear plus) in the early morning. Really enjoyed our stay here. A very chill hostel, which was perfect for us, but don’t come expecting a party hostel. Beautiful gardens and attention to detail. Really tasty and filling breakfast every morning, and very clean rooms and common areas that are cleaned every day. Great value for money. I had a really nice stay here. It's a bit of a walk to the centre of town but not too far. The garden is very nice, good breakfast, nice staff.